Licorice, Glycyrrhiza glabra, is a purple and white flowering perennial, native of the Mediterranean region and central and southwest Asia. It is cultivated widely for the sweet taproot that grows to a depth of four ft (1.2 m). Licorice is a hardy plant that thrives in full sun or partial shade and prefers rich, moist soil. It may grow to a height of 3-7 ft (1-2 m). The wrinkled, brown root has yellow interior flesh and is covered with a tangle of rootlets branching from the stolons. The aerial parts of the plant are erect and branching with round stems that become somewhat angular near the top. The leaves are alternate, odd, and pinnate, dividing into as many as eight pairs of oblong leaflets. Licorice blossoms in late summer. The sweet-pea like flowers grow in clusters forming in the angle where the stem joins the branch. The maroon colored seed pods are about 1-2 in (3-5 cm) long and contain one to six kidney-shaped seeds. Licorice is a sweet and soothing herb that has been appreciated for its medicinal qualities for thousands of years. Hippocrates named the herb glukos riza, or sweet root. Several species of this member of the Leguminosae, or pea, family, are used medicinally. Glycyrrhiza glabra, also known as sweet wood or sweet licorice, is cited first in most herbals. 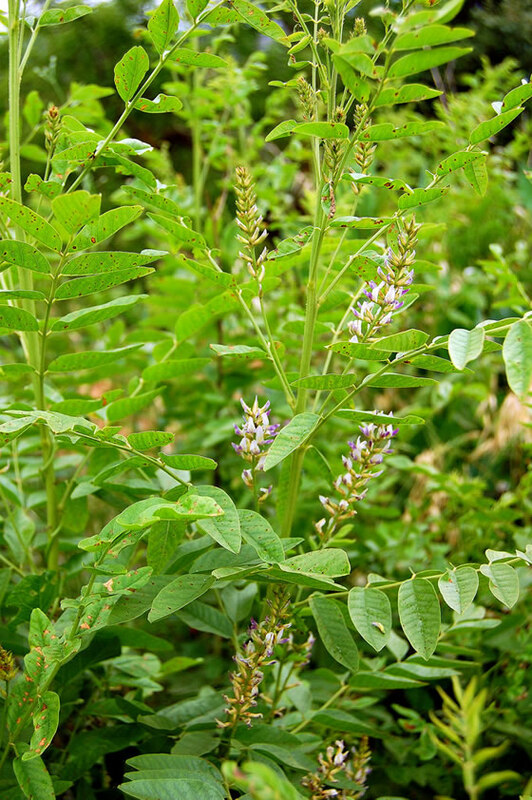 Chinese licorice, G. uralenis or G. viscida, known as the peacemaker, was included in the Chinese classic herbal Pen Tsao Ching over 2,000 years ago, and is believed to promote longevity. 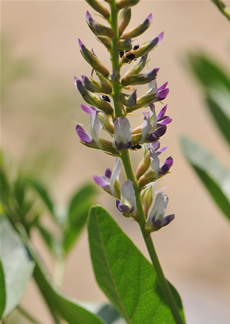 An American variety, G. lepidota or wild licorice, was a common Native American remedy and was also used by early settlers. Dominican friars brought the herb to England in the sixteenth century. The abbess Hildegard of Bingen added licorice to her materia medica, and this well-loved herb was a favorite of German and English herbalists. The medicinal benefits of licorice root have been studied extensively, and its use in traditional medicine is well documented. Licorice is an expectorant, helpful in the treatment of upper respiratory tract catarrh. The root extract is demulcent, and commonly used as a component of many medicinal syrups and drops providing relief to a sore throat and for coughs. The glycoside glycyrrhizin, found in the root, is more than 50 times as sweet as sucrose. 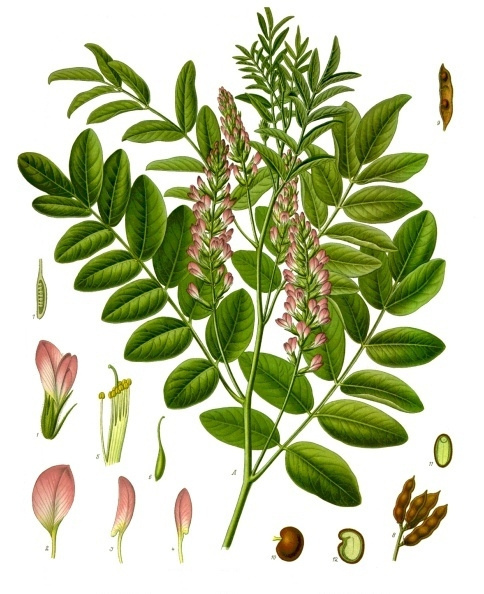 Glycyrrhizin, which becomes glycyrrhizic acid when ingested, has been credited with much of the pharmacological action of licorice. The herb is also effective as a mild laxative, cleansing the colon. Licorice is a liver tonic and is used as an anti-inflammatory medicine, useful in the treatment of arthritis. Along with other herbs, licorice is used to treat muscle spasms. It also acts to reduce stomach acid and relieves heart-burn. Other active chemical constituents in licorice root include asparagine, flavonoids and isoflavonoids, chalcones, coumarins, sterols, and triterpenoid saponins. Studies have shown that licorice also stimulates the production of interferon. Licorice preparations have been used in the healing of peptic ulcers. The demulcent action of the root extract coats and soothes the ulcerated tissue. Licorice also has a beneficial effect on the endocrine system and is helpful in treatment of problems with the adrenal gland, such as Addison’s disease. Phytochemicals in the root act similarly to and stimulate the secretion of the body’s natural adrenal cortex hormone, aldosterone. This sweet herb also has antibacterial action and is beneficial in treatment of hypoglycemia. Licorice increases bile flow and acts to lower blood cholesterol levels. Licorice root, when boiled to extract its sweetness, has been used traditionally in candy making. Commercially it is a flavoring in beer, soft drinks, and tobacco. Singers chew the root to ease throat irritation and to strengthen their voice. Many women’s herbal formulas include licorice for its estrogenic properties as an aid to normalize and regulate hormone production during menopause; however, some recent studies indicate that licorice does not have the estrogenic qualities that have been attributed to it. Licorice is frequently used in medicinal compounds with other herbs. In Chinese medicine, this herb is always used in compound, as it can minimize the bitter taste of some herbal components, and help to blend and harmonize the entire mixture. Licorice also shows promise as a possible chemo-preventive against cancer. Glycyrrhizin, the glycoside credited with many of the beneficial effects of licorice, appears to inhibit the growth of cancer cells as well. In addition, a new polyphenol compound isolated from licorice root has been found to induce apoptosis, or self-destruction, in human prostate and breast tumor cells. Decoction: Combine one teaspoonful of dried root, powdered or diced, for each cup of non-chlorinated water. Bring to boil, lower heat and simmer for 10-15 minutes. Dosage is three cups per day. Prepare fresh decoction daily. Tincture: Combine one part dried root, powdered or diced, with five parts of brandy or vodka in a glass container. A 50/50 alcohol to water ratio is optimal. Seal the container with an airtight lid. Leave to macerate in a darkened place for two weeks. Shake daily. Strain the mixture through a cheesecloth or muslin bag and pour into a dark bottle for storage up to two years. Dosage is one to three milliliters of the tincture three times a day. People should avoid using licorice in large doses for long periods of time. This herbal remedy should be used for no longer than four to six weeks without medical advice. Pregnant women should not use the herb. Persons with high blood pressure or kidney disease should not use licorice, nor should those with cholestatic liver disorders or cirrhosis. Excessive use of the herbal extract may raise blood pressure, cause water retention, headache, and potassium loss; however, for persons on high potassium, low-sodium diets, this may not be a problem. Licorice taken in its natural form, such as chewing the root, may mitigate the side effect of water retention because of the high presence of the plant constituent asparagine. Deglycyrrhizinated licorice extract is commercially available for treatment of peptic ulcer and eliminates side effects possible with other licorice preparations.